Some excellent performances by the Morpeth Harriers competing in the Northern Schools Inter County match at South Shields on Saturday put many of them in line for selection for next month’s English Schools Championships, to be held at Witton Park, Blackburn, writes George Patterson. The match, featuring teams from Northumberland, Durham, Cleveland, North Yorkshire and Cumbria, saw four of the club’s athletes gain individual medals. First of these was Holly Peck who was an emphatic winner of the Minor Girls’ race, although sadly from her point of view, this youngest age group is not included in the national event. Clubmates Lily Heaton and Rhiannon Hedley also ran well in this race, placing 18th and 20th respectively (third and fourth from Northumberland), while recent Morpeth recruit Ruby Wyld gained valuable experience in finishing 44th. In the Minor Boys’ race, Thomas Cunningham recovered well after confusion at the start to place 16th, which was fifth home for Northumberland. In the Senior Boys’ event, there was a silver medal for Morpeth’s Nathan Cox who was the only athlete to mount a serious challenge to North Yorkshire’s Sam Dickinson. The better-than-expected underfoot conditions favoured Adam Gibbs, who was the next Northumberland runner, in seventh place, while Phil Winkler showed signs of returning to better form as the county’s third runner in 15th place. James Young in 29th position was the sixth Northumberland runner, giving the club a chance of four Senior Boys earning selection. With Elliott Kelly, representing Durham, who placed 18th in this race also likely to be picked for the English Schools, the club clearly have an abundance of ability in this age group. The Northumberland Senior Girls’ squad were emphatic winners of their team race with eight runners in the first 23. 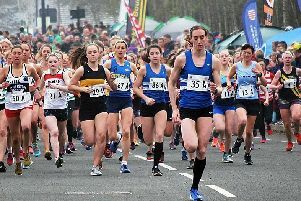 Morpeth’s Emma James placed 17th, just one place ahead of clubmate Charlotte Jewell, while Alison Brown, suffering from a foot injury, struggled home in 23rd position. All three must now await the selectors’ decision as to whether they are included in the English Schools teams. A further medal came Morpeth’s way through Scott Beattie’s third place in the Intermediate Boys’ race – a race won comfortably by Cleveland’s Nathan Baker, the North East champion. Kieran Hedley continued his recent good form, finishing as the next Northumberland runner in seventh place. Adam Shrewry produced a greatly improved run in 38th place with clubmate Jacob Hopkins, struggling with a back problem, finishing 41st. As fifth and sixth Northumberland runners on the day, both will come underconsideration from the selectors although some of the county’s leading athletes in this age group were missing on this occasion. Cameron Kirk was another Morpeth athlete representing Northumberland, finishing 56th. In the Intermediate Girls’ race, Abby Sheldon was Morpeth’s only runner but her 32nd place (sixth Northumberland runner) will have done her English Schools selection chances no harm. Taylor Glover gained Morpeth’s fourth medal of the day in the Junior Boys’ race when he finished second behind Cleveland’s 2014 National champion Josh Cowperthwaite. With clubmates Joe Dowd, Ross Charlton and Daniel Dixon finishing 18th, 19th and 28th respectively (third, fourth and sixth Northumberland runners) the club should be well represented in this age group at Blackburn. Alex Cunningham also placed 53rd in the Junior Boys’ event while Kate Seymour was 41st in the Junior Girls race – a performance that also gives her a chance of English Schools selection. Overall, Northumberland were third of the five counties taking part, behind comfortable winners Cumbria and North Yorkshire. Three Morpeth Harriers were in action at the North East Masters Association Cross Country Championships, held at Darlington on Saturday. Fergus Bates finished sixth overall in the Men’s race, and was third in the Over 45 category. By virtue of finishing in 32nd place overall, Gavin Bayne found himself fifth in the Over 55 Male Veteran section. Archie Jenkins was 66th overall and was eighth in the Over 60s section. Several Morpeth Harriers took part in respective Park Runs on Saturday and there were some prominent finishers among them. The most prominent was at South Shields, where Michael Morris was only a mere second outside his best on the 5k course, when he was first across the finish line in 15m56s, which made him nearly two minutes ahead of the rest of the field. Meanwhile, over in Druridge Bay, Mark Snowball was also only a second adrift of his best on the course when finishing second overall. Five places behind Mark was his club colleague Lorna MacDonald, who was first female finisher in a time of 20m21s. Other Morpeth Harriers who were prominent finishers at Druridge were Richard Kirby (16th) 21m53s, Scott Wilkes (21st) 22m45s, Sarah Wilkes (26th) 23m30s, Bobby Stone (27th) 23m50s and Damian Foster (28th) 23m51s. In the Newcastle Exhibition Park Run, Morpeth Harriers new signing Chris Smith, formerly Wallsend Harriers, finished second to Tipton’s Ryan McLeod in a time of 16m22s. Further down the field, Morpeth Harrier Paul Banks was 21st across the finish line, setting new figures of 18m51s. Meanwhile, down in York, Morpeth Harrier Craig McBurney, who has been abroad carrying out his Army duties for several months, made a superb return to running action, when he finished second to York Acorn AC’s Craig Poulton, clocking a new best time of 17m40s.